LoCATE (Local Community Archaeological Trai ning and Equipment) is a partnership between archaeologists at Bournemouth University and the New Forest National Park. Working with archaeological societies and community groups from across Dorset and Hampshire the project provides access, training, and support to advanced survey equipment that would otherwise be hard to obtain. LoCATE aims to support the research that local groups already do by extending the range of techniques and skills they can use. The goal is to enable an even greater contribution to the understanding of the rich archaeological heritage of our region. This is done specifically by providing access to equipment that is not always accessible to local groups. 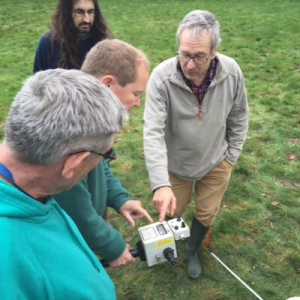 The current equipment that is freely available for groups to book out and use in their own time is a FM36 Magnetometer and a RM15 Resistivity meter. These have been supplied and maintained by Bournemouth University who also provide free training for interested users. Park Farm Excavation 2018. Bronze Age Barrow?